I was looking for something new. Something portable and delicious. Something summery. What I found was Orange-Coconut Bars in the Better Homes & Gardens Biggest Book of Cookies. Sounded promising! I made only a few changes to the recipe. The first change was to get rid of the cup of chopped pecans that it called for in the crust. I'm sure pecans would be wonderful, but alas, the family's allergic (and they're my taste-testers, after all). I replaced the pecans with graham crackers and increased the butter just a bit (I also added a little salt). The next change I made was to replace the orange with tangerine. You could make it either way; orange would be yummy, I'm sure. 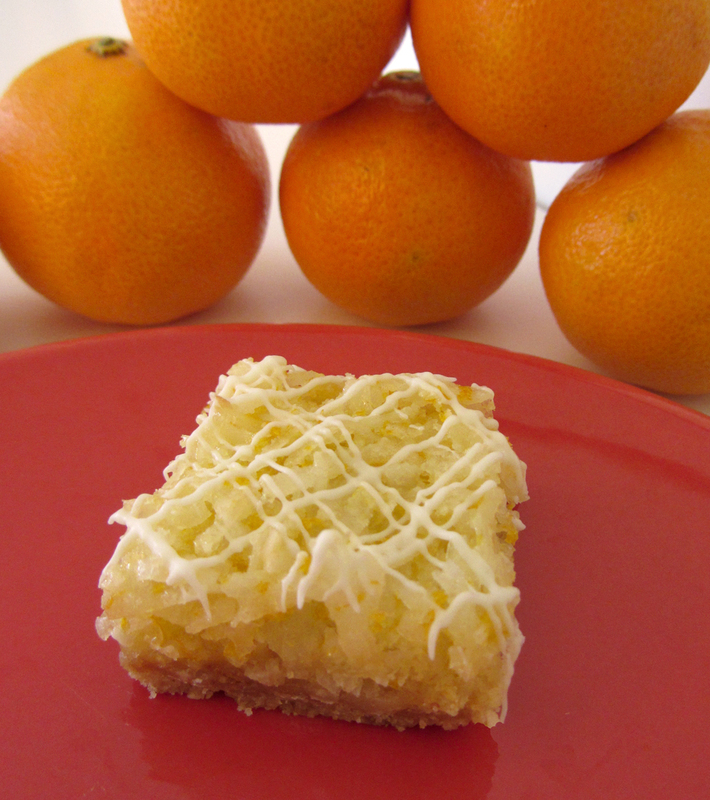 I just love tangerines (and I think it makes the bars a little more special). I made some adjustments to the process, too. And, finally, I drizzled white chocolate over the top. Did it need it? Nope (but why not?). These bars are a lot like lemon bars in the way they're made. They're sweet and coconutty and and the tangerine gives them tang. Definitely a good summer cookie! 1. Preheat the oven to 350°. Line a 8" X 8" baking dish with parchment paper and spray lightly with oil. 2. For the crust: add the flour, sugar, grahams, and salt to the bowl of a food processor. Process until mixed and the grahams are crumbed. Add the butter pieces. Pulse until the butter is incorporated and the mixture is sandy. 3. Pour the crust into the baking dish. Press firmly and evenly into the bottom of the dish. Bake for 18 minutes or until light golden brown. 4. Meanwhile - For the filling: wipe out the food processor bowl. Add the sugar, flour, baking powder, and salt to the bowl. Process until well mixed. Add the eggs, zest, and juice. Process until well blended. Pour the mixture into a medium bowl. 5. Stir the coconut into the filling mixture. When the crust is done, pour the filling over the hot crust. Return to the oven. Bake for about 20 minutes or until the center is set and the edges are golden brown. 6. Remove the dish from the oven. Let cool completely. 7. Place the white chocolate in a small bowl with the oil. Microwave for 10-15 seconds at a time, stirring in between, until melted and smooth. Drizzle the white chocolate mixture over the cooled bars. Let set. 8. Cut into bars and serve! To store: cover and chill.